Prague in November 2015. Photo by the writer. Prague is one of Europe’s elite cities, renowned for its picture postcard views, fine old buildings, a magnificent medieval clock, abundant beer and tasty dumplings. This is a list of my favourite things. Prague is listed as one of Europe’s most beautiful cities by UNESCO, the UN’s cultural agency. Emperor Charles IV founded the New Town in 1348 with the grandest of designs, to build the “New Jerusalem”. Architects followed his dream down the centuries. There’s so much for the first (or 101st) time visitor to see. 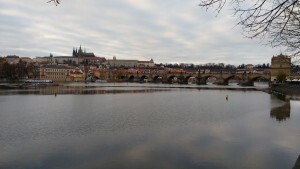 Linking it all is the C15th Charles Bridge, the great pedestrian crossing of the Vltava. Prague Castle towers above the city. There are fine houses, churches and palaces everywhere you look. The crowning baroque glory, St Nicholas Church, built in 1735, towers above Old Town Square. Close by is the medieval astronomical clock. Arrive early for the elaborate parade of apostles as the clock strikes the hour. The works of provocative and often irreverent sculptor David Černý. pop up everywhere. His model of Sigmund Freud casually hangs with one hand from a high beam jutting from a building in Husova St. In the Lucerna Palace mall, St Wenceslas rides an upside down horse, poking fun at the original statue in Wenceslas Square. Bronze babies crawl outside Museum Kampa, a grounded version of similar infants scaling the Žižkov Television Tower. (Worth a visit itself). Two male statues relieve themselves into a pond in the shape of the Czech Republic outside the museum to the writer Kakfa. Černý’s latest opus (2014), at the Quadrio shopping centre, is a 30 ft high mechanical statue of Kakfa’s head composed of 42 constantly shifting cross sections. When I first visited Prague in the 1990s, hotels were standard Soviet-era issue, big and dull. How things have changed. I sampled one of the city’s new generation of smart, small and distinctive boutique hotels, woven into the city’s ancient fabric. The Golden Key opened in 2014 in a C13th building which used to be a locksmiths, set discreetly off Nerudova St, a steep cobbled route to the castle. I liked the glass roof over the lobby, and links with the past such as the uncovered C16th painted wooden ceilings, old wood floors and a piece of 200 year old original furniture in every room. The hotel’s pretty little cafe, open to the public, serves homemade cup cakes and fruit cakes from local recipes. In addition to its glittering centuries-old buildings, Prague has another claim to architectural fame. Some of the finest creations of the colourful and decorative Art Nouveau (AN) movement, from the early years of the 20th century, are found in the city. Its characteristic elegant, flowing curves pop up, for example, on the outside of buildings, as in the ginkgo branches carved on the façade of Hotel Central. Those sensuous AN details are on balconies and frescoes, in bars and restaurants, and in the main train station. The exquisite stained glass window of St. Vitus Cathedral is the work of Czech artist Alphonse Mucha, one of the movement’s leading figures. Some of the most striking and sumptuous interior design inspired by the movement is in the Grand Hotel Europa’s restaurant. A longer piece by me on Prague here.